This is my 4th year involved with the Pan Mass Challenge and my 4th year as a Team Kermit member. 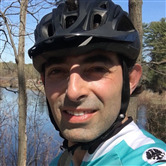 The Pan Mass Challenge is a bike event that crosses the state of Massachusetts (approximately 192 miles), where over 6,500 riders and their donors raise the much needed funds to fight against cancer. Hundreds of survivors holding signs by the side of the road express their gratitude and a clear message to you and me: “Thanks to you I am alive”, “Thanks to you I am 13 y/o”, etc. Hundreds of cancer survivors proudly carry their “Living Proof” pins as a testimony that this fight is NOT IN VAIN. At the end of the day it is up to you and I, who claim to be good people, who are godly and generous, who are cancer free, who have an extra few dollars, who want a better future for our children and grandchildren, and who can make a difference to save lives today. Please consider helping out with any amount that you can. This year I am raising money as a virtual rider because I am spending a lot of time in South America and might not have time to train enough for the event. Your support is much appreciated by the patients, by our pedal partner, by cancer survivors, by the scientists who spend all their effort trying to find cures against cancer, by many of us who are involved with this great cause. please help us and be part of the team who will write the history of getting rid of cancer someday.